Performing local SEO keyword research can seem harsh. You might have a niche field in a place where you wonder if anyone is even looking for your services that you give. You might also have a shop, but you can’t figure out what to blog in your area to drive foot and site traffic. I’m here to show how you should use Google Trends for your research and dominate in local SEO! In this blog post, I am going to show how a local bicycle shop that is located in Massachusetts can use Google Trends for their local SEO keyword research. Let’s begin. Google trends is a website that takes social trends from the world and aggregates it based on popularity, search intensity, and more social clues. Significant events like the NBA playoffs, healthcare, the election, and more can be visualized in many different graphs when you come to the homepage. While the global perspective is impressive, we are going to focus on a drill down to a particular state in the United States. Here was the search term that I used. Very generic, but it already gives me so much insight. I used the term bicycle shop and narrowed my search to the United States. This picture above is the search pattern for the last five years by default. From here, I can see spikes during the warmer months and dips during the colder months. This type of keyword analysis tells me that this theme will be seasonal. That makes a lot of sense as biking is more of an annual activity. It also makes sense that people will be looking for a bicycle shop when the weather is warmer since that can mean biking soon after going to a store. This is the same case if you think of other seasonal things like wearing sandals, buying winter jackets, and more. Here is the breakdown of all the states of the United States. 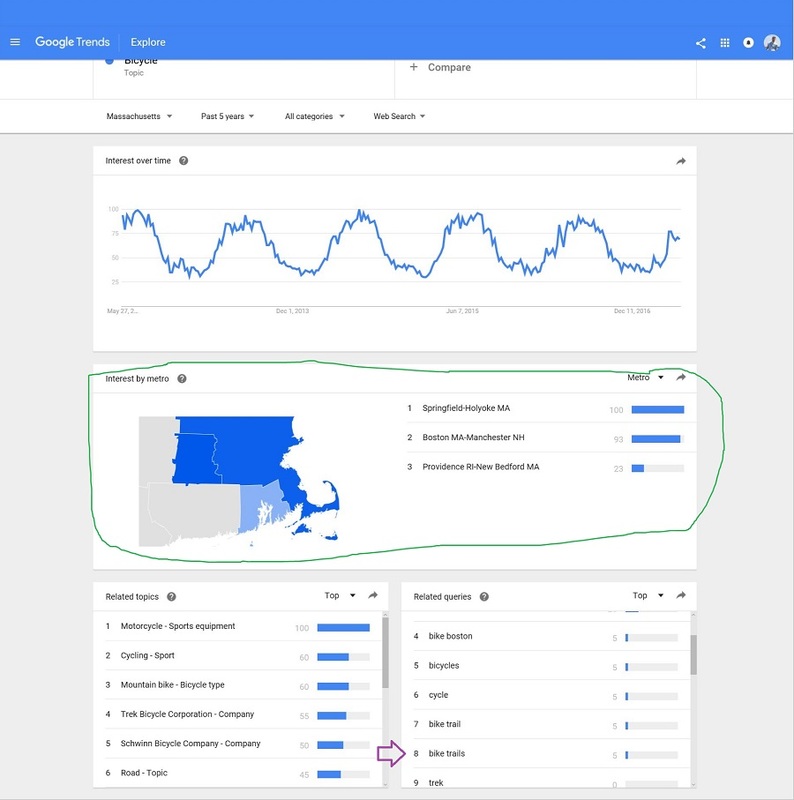 At first glance, you might feel like Massachusetts is not as high in search interest since it is not seen in the first 6, but this is skewed because of how popular biking is in the other states. Since we are local, we will scroll down the state list to find Massachusetts and click on it. As you can see above, I am looking for the search term that is located in Massachusetts. 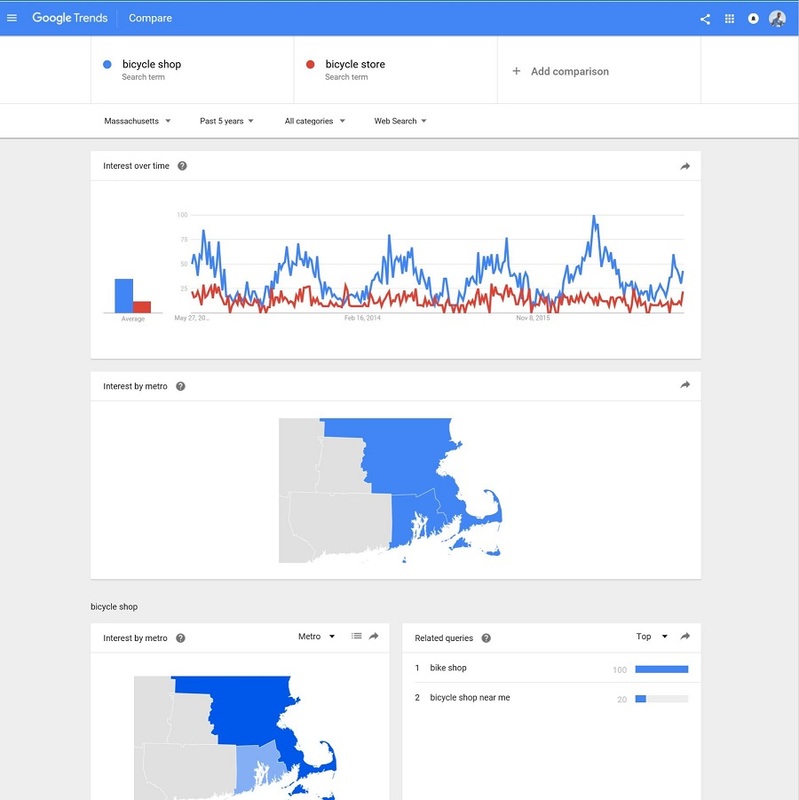 Google trends are showing me that there is a lot of activity in two parts of Massachusetts. That works fine since in this made up scenario my bicycle shop will be located in Boston. 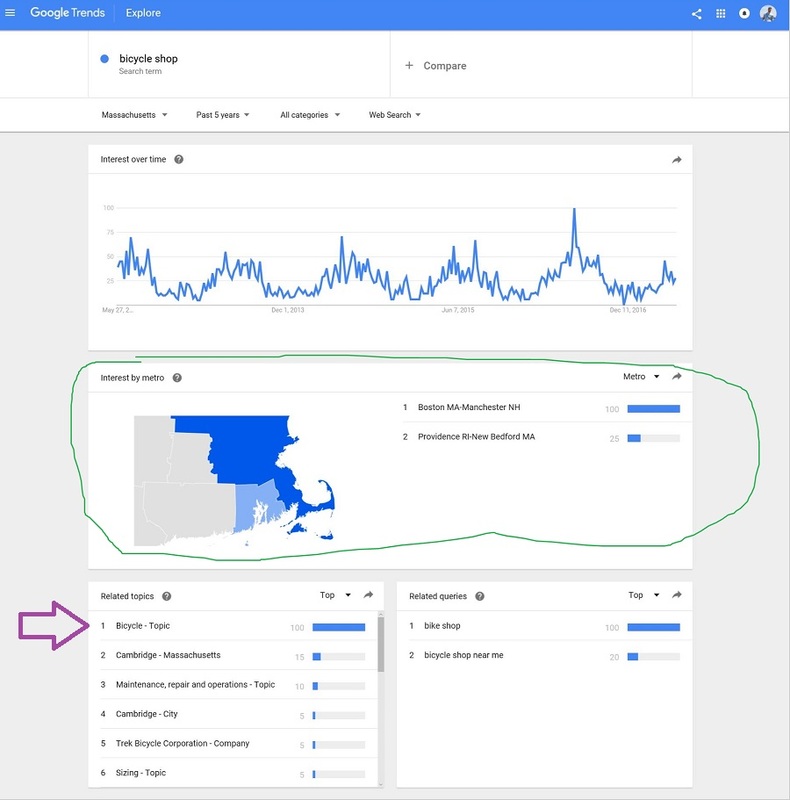 Now that we know that there is interest in this area for my local business, I want to look for related topics that people search for in Massachusetts that are around bicycles. In this example, I clicked on the item called the bicycle. With the topic field ticked off, I can see that my topic draws interest for three main locations in Massachusetts. With my store presence in Boston, I know that I need to have a good web presence as well. By scrolling down the list of related queries, I can see that bike trails come up. That would be a great thing for my site to cover as people might want to take their bikes off the streets and go somewhere more quiet and safe. I can see that there is interest in this topic, so I click on it to expand it within Google Trends. Now that we know that bike trails in Massachusetts have good interest, we now want to see what themes we should cover. Using this type of information is where Google Trends gets so high for local SEO keyword research. Check out the list below. By seeing that places like “near me,” “cape cod,” “Provincetown,” and more came up shows me that there is real interest in this topic. With my website, I could make a great resource that covers many of the top trails are situated in Massachusetts. Then you can have sections or pages that include more micro levels like Cape Cod and explore places like Provincetown in the blogs. Another neat feature of this tool is to compare different topics, search terms, and more against each other. For this example, I want to see if I should be optimizing my site for bicycle shop vs. bicycle store. As you can see above, shop outperforms store regarding search interest. Data like this is vital for me to know when trying to go after this primary keyword for SEO. 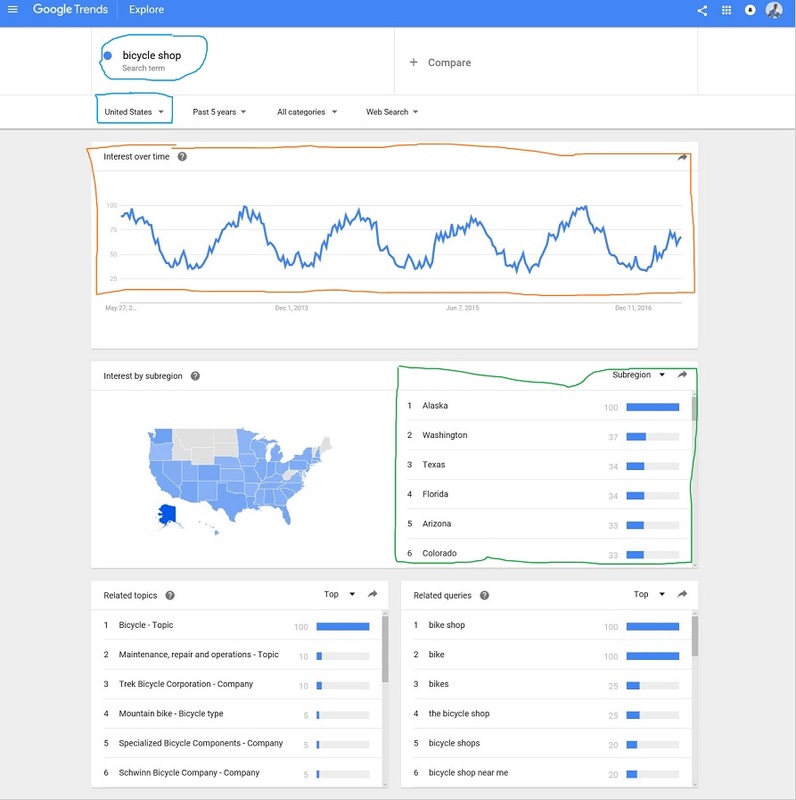 We went over why Google Trends is a better option than just looking at sheer search volume with Google Keyword Planner Tool. The amount of detail you can get with this tool entirely overshadows the keyword tool. We went over how to break down the United States by a state and then how to drill down into search interest on a topic. We also broke down on how to take a primary keyword target and break that out into more topics like trails around Massachusetts. Finally, we went over how to use the compare section to see how specific terms and themes compared regarding search interest. If you are looking for a video around Google Trends, I would recommend checking out this site. If you are looking for help, I offer Boston SEO services along with a SEO Audit that can uncover a lot of local opportunity for your website.